The last time we swam with sharks we were in Belize while diving our way through Central America in 2003. We had gone down take our dive masters course in Honduras for the winter. We were already accomplished rescue divers with nearly 100 dives under our belts in the deep cold waters of Ontario's Georgian Bay and the St. Lawrence River. We had just finished up diving the beautiful Palancar Reef of Cozumel and now we're making our way through Central America. It's been a long time since we've been back in the water and there is no better place to get your feet wet than in the Galapagos. You see, it was in Central America that I came down with a thyroid disorder. Upon our return home, I was diagnosed with Hyperthyroid and Graves Disease. It had progressed so far that I had to be put on the medication propranolol to slow down my rapid heart rate. I had lost a drastic amount of weight due to my metabolism working in hyperdrive and because my hormones were so messed up, I was extremely emotional. This cut my diving career short due to the fact that I suffered more than a few panic dives and felt high stress when entering the water. Had I known I was sick, I would have gone home and fixed myself up, however, I just thought I was being an emotional woman and pushed through each dive forcing myself to get better. Instead I developed a phobia of the water and every time I have tried to go back in I have a panic attack. We aren't diving again yet, but we did snorkel in some of the most exotic waters on earth here in the Galapagos. It was the perfect conditions for overcoming fear as we had to jump off the boat into deep waters of the Eastern Pacific. The sharks came during snorkel number two. We jumped into the cool waters and drifted through two giant cliffs of Sleeping Lion Rock in a swift current. We knew that we had a good chance of spotting sharks today. The last time our guide Sambo was out, they saw at least 30! Once we drifted through the channel, we came out to calm waters on the other end and were told to swim close to the shore for shallower waters and a clearer view of the coral and wildlife rather than the deep abyss below. Several sharks were circling below us coming in for a closer look. Our guides told us that they don't normally come so close. 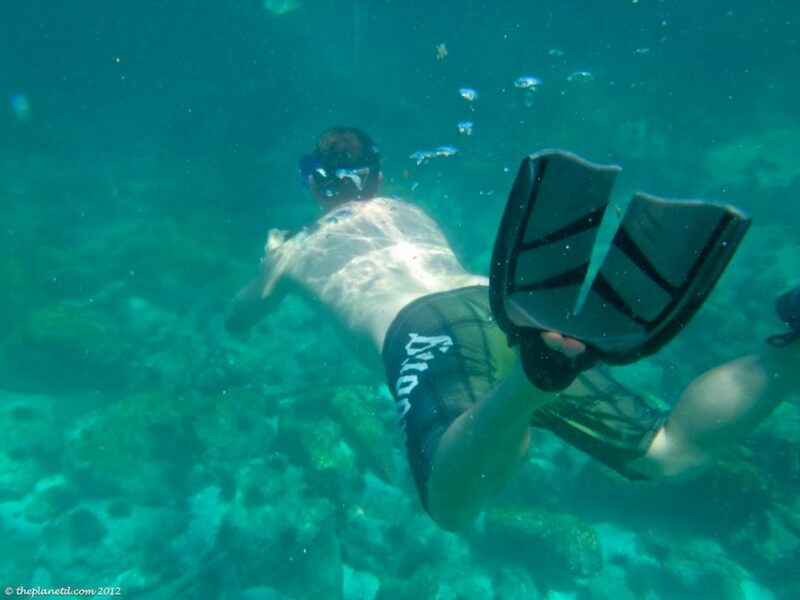 Usually there are many sharks, but they tend to stay deep below and farther away from snorkelers. For some reason, these guys seemed to want to take a closer peek at all of us. Dave did an amazing job diving down to get better photos and our guide grabbed Dave's camera to get some even closer shots of the sharks. It was great having the professionals along who know the sharks well to be able to capture some extra footage for us. Our camera didn't take the best underwater photographs, but the video on the Olympus Tough took incredible footage. Check out our latest footage of Swimming with Sharks in the Galapagos. By the way I conquered my fear and I'm not afraid to swim in deep water anymore. I enjoyed every minute of snorkelling in the Galapagos and I didn't have one panic attack. Who knows, maybe I'll be able to put on the old regulator again one day. Wanna Know What It's like on an Active Galapagos Tour? « Wanna Know What It’s Like on an Active Galapagos Tour? 17 Responses to "Swimming with Sharks and Video"
Great pictures and lovely video. I have been swimming regularly since last 5 years but never swim in deep sea as I am always scared of sharks. Are sharks friendly and what safety precautions we must keep in mind if we saw shark around us? Hi San Antonio, not all sharks are friendly and you have to take precautions. The Galapagos sharks are known to be a safe place to snorkel. There are other sharks that we’d never get in the water with. Nurse Sharks and the Galapagos sharks, these are good sharks to swim with, but there are many sharks that are dangerous. If you are going on a snorkelling or diving excursion, just go with a reputable company that knows the waters. Most of the time you’ll be just fine. Cool that you were able to conquer your fear! And in such a majestic place no less. 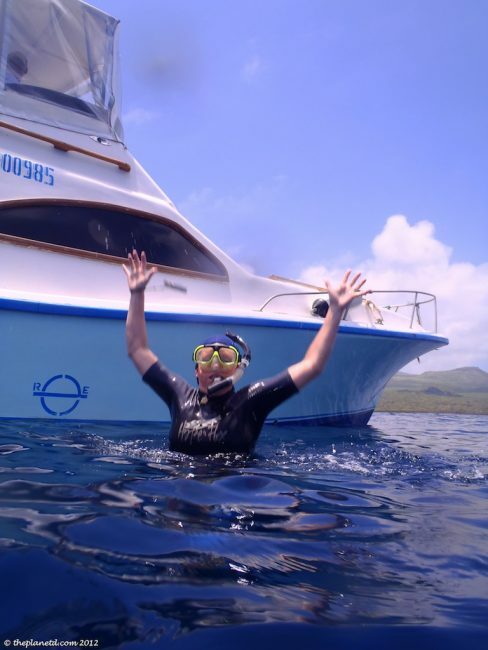 I snorkeled in the Galapagos too and had a panic attack when I jumped in. I spent most of the next few days on the boat watching others snorkel. Only on the last day did my wonderful roommate take me with her and swim with me arm in arm so I could see the beuaty for myself. Galapagos is my favorite place to dive! I did a 7 day liveaboard to Wolf and Darwin and it was amazing. Great that you conquered your fear and sorry to hear about your illness. It doesn’t sound like your letting it slow you down though. Thanks Laurel. Luckily I am not sick anymore. I started traveling and magically got better. I have a feeling stress had a lot to do with my thyroid problems even though a doctor would never agree with me:) Glad you loved the Galapagos as well. It’s a pretty spectacular destination. Maybe I’ll be diving again in the future, you never know. For now, I’m happy to be able to be snorkelling again without panicking. Cheers. For some reason, I always think of you guys in Antarctica and such places, but you look quite relaxed on the boat! Wow, what an experience! Great video! Well snorkelling is the first step right? Inspirational story Deb. Pleased you overcame your fear and are diving again. I love the look of Lion Island in Dave’s photo too. Sharks are beautiful creatures but are threatened by “finning”. What did you learn about the measures being taken to prevent shark finning in the Galapagos and Ecuadorian waters? Great video, guys! One of my favorite memories from the Galapagos was following a reef shark into a shallow cove while filming him on the video camera, then looking up to see 6-7 more sharks laying on the ocean floor just below him. I looked around to see if the rest of our group was getting a chance to see it, only to realize everyone but Mary had high-tailed it out of there when they saw all the sharks! 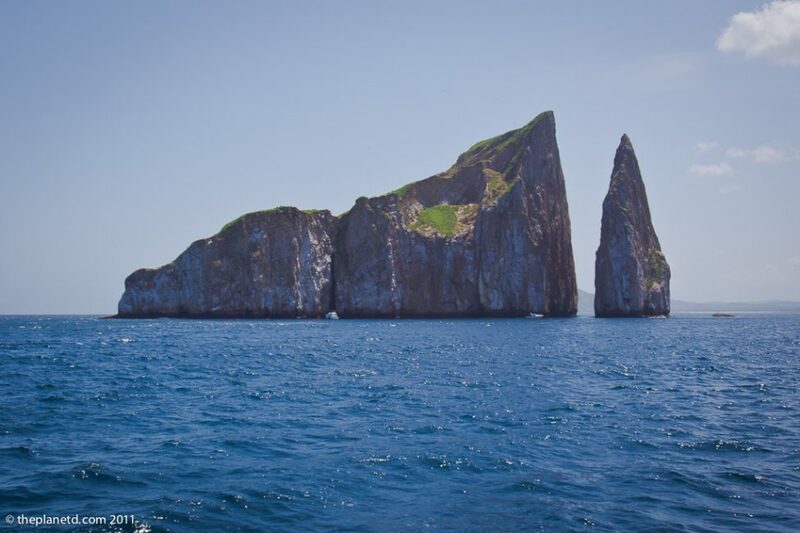 Isn’t Galapagos snorkeling the best? So sorry to hear about you being sick. That’s awful and the worst place to find out is on the road. You’re really brave to carry on conquering your fear. I’m so glad you were able to overcome your fear! Swimming with sharks must’ve been amazing, although it probably would’ve freaked me out at the same time. That video quality is really good! I’ve been looking for a good camera to take into the water/sand/other places cameras shouldn’t go. I’ll have to look into this one more. Wow. Amazing video. Tempting to touch one.